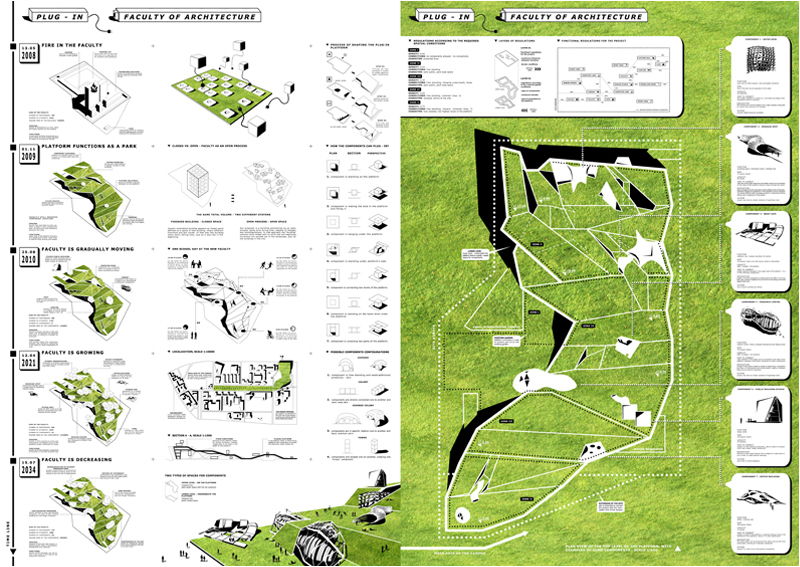 Plug-in faculty of architecture is a proposal for the future faculty submitted for the Open International Ideas Competition – Building for Bouwkunde. Design addresses notions of changeability, adaptability and self-organization. Instead of a building perceived as one uniform and closed volume with strictly defined functions, it is an ongoing open process being able to evolve in time. There are several steps in which the faculty is coming into existence. 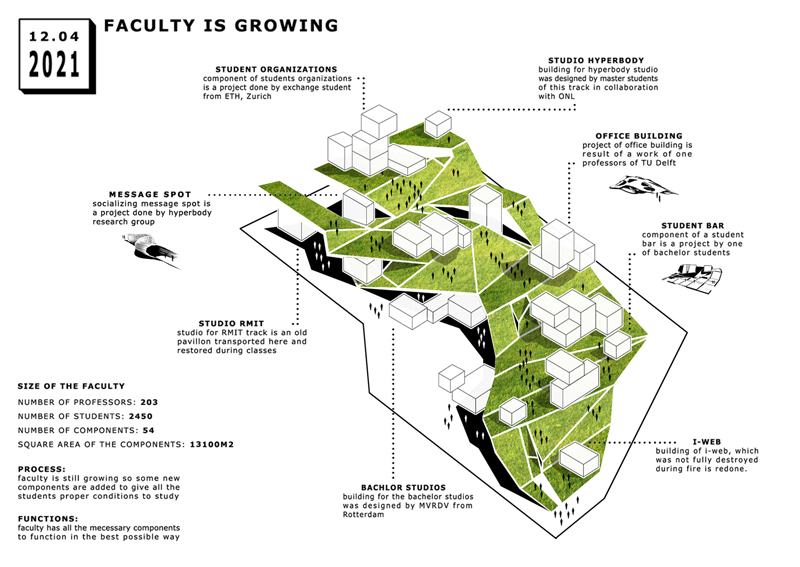 First of all the site is being transformed into a landscape with a new platform that enriches existing spatial qualities and extends the green axis of the campus. It provides green areas above and different spatial conditions underneath. Then the dispersed functions “plug in” themselves into the given platform. They are positioned according to the masterplan rules defined in two ways: as a spatial zoning law and functional relations. The first one describes the density, character of each zone and the way the components can connect to the platform. The second one defines relations between specific functions which need to be kept, creating a system of restrictions where still a certain amount of freedom is left, allowing for different scenarios to happen. All components are able to connect to each other and to the platform. The specificity of these connections differently depends on their specific requirements. Moreover, components can be inserted into two different environments – open air area above the platform or semi-closed space underneath. There is also the third kind of space embedded within the plug-in platform itself which hosts the entire required infrastructure and some fixed areas (toilets, magazines, offices). Such open building formula gives possibility of adding new components over time, changing or even removing the old ones. Therefore the faculty stays always up-to-date being able to respond to current needs. Moreover students can design and add functions that they need during their study time, what lets them actively participate in the design of the faculty. Another important aspect of the proposal is the idea of an open building functioning as a city structure on a small scale, where the spread out components resembles the spread of buildings through the city. 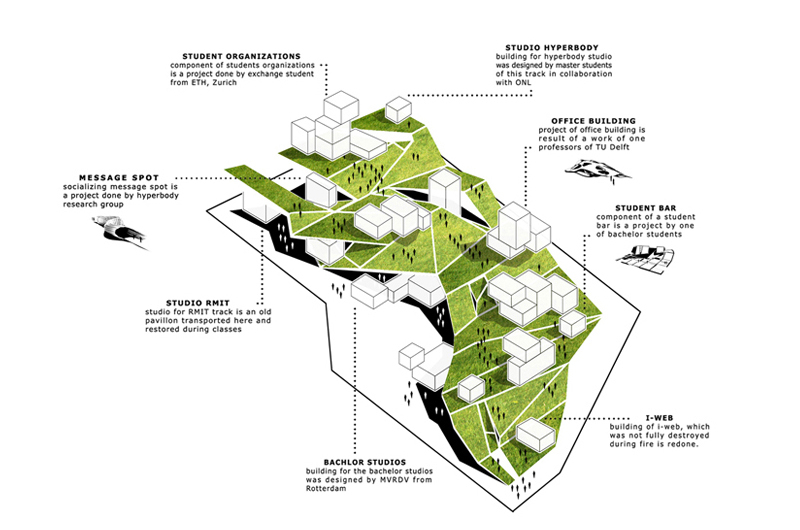 All functions are distributed in the landscape, where students can bike from one studio to another breathing fresh air and relaxing in the sun.